On Friday, July 26, 2014, our very own director of, The Burrito Project, Alan Pinel, AKA TofuAlan, was headed to Orange County to teach dance classes at Atomic Ballroom in Irvine, CA. It just so happened that his usual route along the 5 Freeway from Pasadena to Irvine was destined to be a parking lot for over 3 hours from about 3pm to 6pm that afternoon. Traffic was at a complete standstill due to a man standing on the ledge of the overpass half a mile ahead. After sitting on the freeway for over 20 minutes Alan noticed a guy 3 lanes over fill up his water bottle from a water jug stored in the side of his construction vehicle. Armed with his thirst, a red Solo cup and a box of Triscuits, Alan walked over to guy with the precious water jug and offered a trade of crackers for water. He was met with a smile, some Triscuits were exchanged and as Alan walked back to his car he shared his crackers with his fellow drivers who were stuck on the freeway. Soon, people were getting out of their cars and chatting with each other offering snacks, conversation and even lending mobile phone chargers to fellow drivers stuck in a strange situation on a Friday afternoon. Alan had hosted a Fundraising Poker Tournament the week before and his poker chips were still in his trunk. 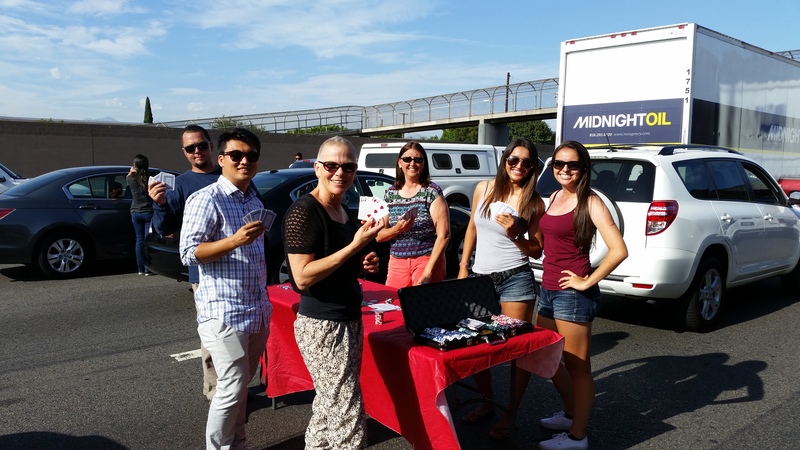 He noticed a folding card table in the SUV next to him and proposed setting up a poker game in the middle of the freeway. Within minutes the poker table was being set up including a red table cloth. 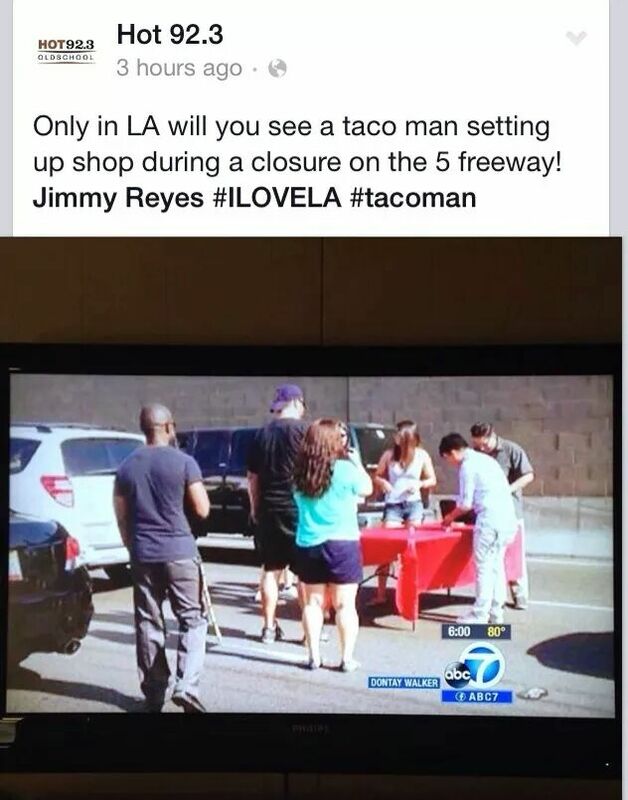 Sarah Jung, of Los Feliz, posted a photo of the scene on Instagram and within minutes a poker game among stranded drivers was being portrayed as a #TacoMan setting up shop on the 5 Freeway. As the afternoon hours were spent on the 5 Freeway this crew of new found friends shared laughs, stories and posed for pictures which were being snapped by fellow drivers with their mobile phones. 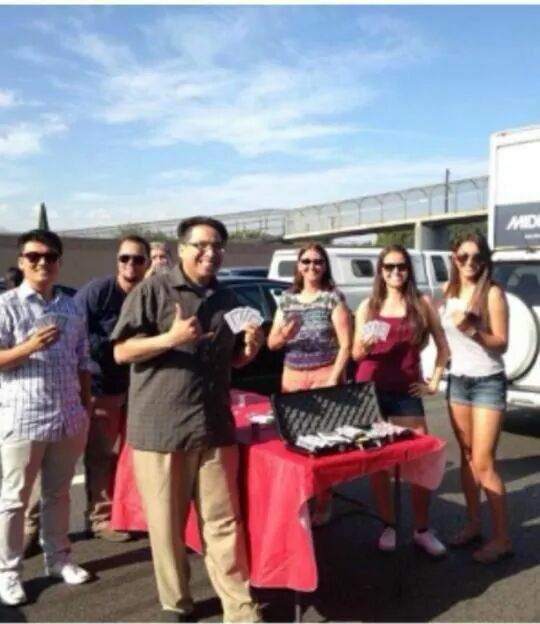 Two young ladies who joined in the fun were headed to San Diego to referee a soccer game the following day. After playing poker, a soccer ball magically appeared and this fun group of people had time to play pass between their stopped vehicles. Soon after they started playing with the soccer ball, the CHP approached the merrymakers and relayed the good news that all the drivers should return to their vehicles so they could safely turn their vehicles around and drive off the nearest exit which was behind them. 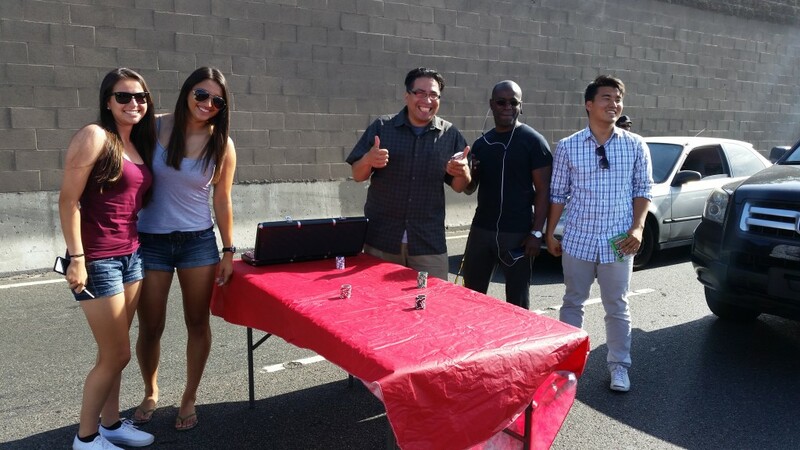 Within 30 minutes the freeway was cleared of cars and these friendly drivers returned to their busy lives with a story to tell their friends. When Alan was asked why he first decided to get out of his car, his first response was, “It was hot and I was really thirsty!” If you’ve ever met Alan, you might get the feeling you could have fun with him in a stuck elevator. Whether or not this is true, it’s been proven you can have fun with him on a shutdown freeway. For more fun, come play poker with, Alan the #TacoMan, every month to help raise funds for, The Burrito Project. If you have fun there, you may consider helping out at the next Burrito Project which takes place on the 3rd Thursday of the Month in Los Angeles.